I own a Rodgers Model 945 organ. It is a first generation Rodgers Parallel Digital Imaging (PDI) instrument that I purchased the year it was introduced. It is a very complete three-manual American Classic organ in the style of the large Aeolian Skinner instruments from the mid 20th century. I have enjoyed it immensely since the day it arrived and barely squeezed through my front door! You can see the original Rodgers one-page glossy add with specifications here. This is also the instrument that I have used to create all of my Hauptwerk organ recordings to date. I am building a large three-manual double bolster theater organ console that I intend to use as a controller for Hauptwerk theater organs - but this is another story. I plan to install a switch on my 945 to turn off its internal sounds yet still allow Hauptwerk to play through the Rodgers' auxiliary audio input. When this is accomplished, I can use the 945's stops and couplers to control Hauptwerk directly, completing the integration of the hardware console with the Hauptwerk software sound generator. In anticipation of this, I have created this Hauptwerk organ. It matches the Rodgers' stop and coupler specification exactly and is a reasonably good approximation of the overall sound. Of course, it also plays as a stand-alone Hauptwerk instrument. I also took it as a challenge to do this using only free Hauptwerk rank samples. 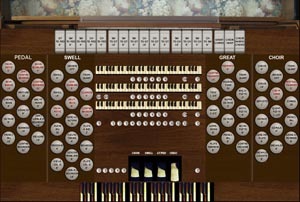 This means that everyone in the Hauptwerk community can now have a complete three-manual American Classic organ. It may not be perfect, but it is real good and its free. The samples come from four free sources. 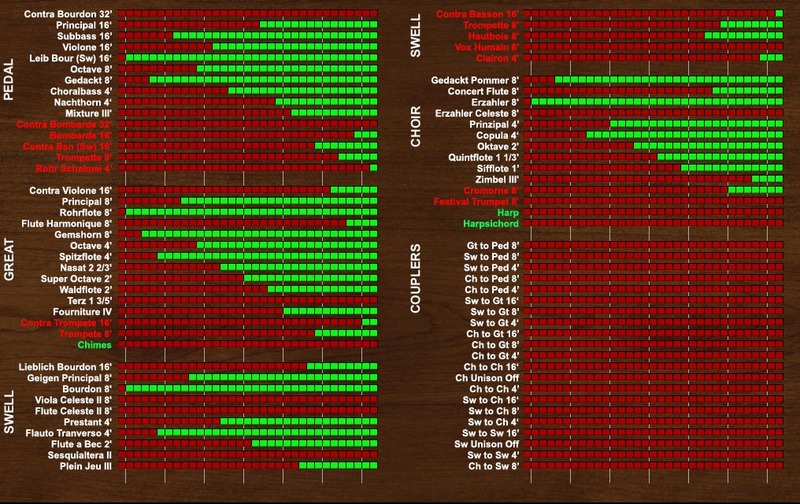 Most of the organ uses the ranks from the excellent Jeux d'Orgues instrument. A few stops come from the Paramount 310. The harpsichord is from Sygsoft. Finally, I needed a chime stop but there were no free Hauptwerk stops that I could discover. Instead, I used the free soundfont developed by John Tay for use with the Miditzer project and extracted the one chime sample. John has granted me permission to distribute this sample for noncommercial Hauptwerk use. 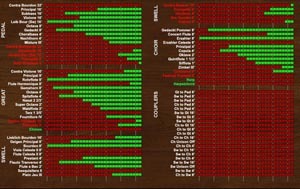 I created the Chimes rank from the single sample and it is included here as a free unprotected rank that can be used by others in new organ design. In order to install and use the Model 945 organ, you must first install the Jeux d'Orgues, Paramount 310, and Sysgsoft Harpsichord instruments. You must abide by each of their individual licenses as well as the Hauptwerk license. However, the reward is great for your efforts! 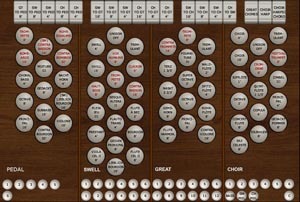 Version 2 ofthe Model 945 Organ has been updated to take advatage of several new features in Hauptwerk 4. It will not run in Hauptwerk 3. 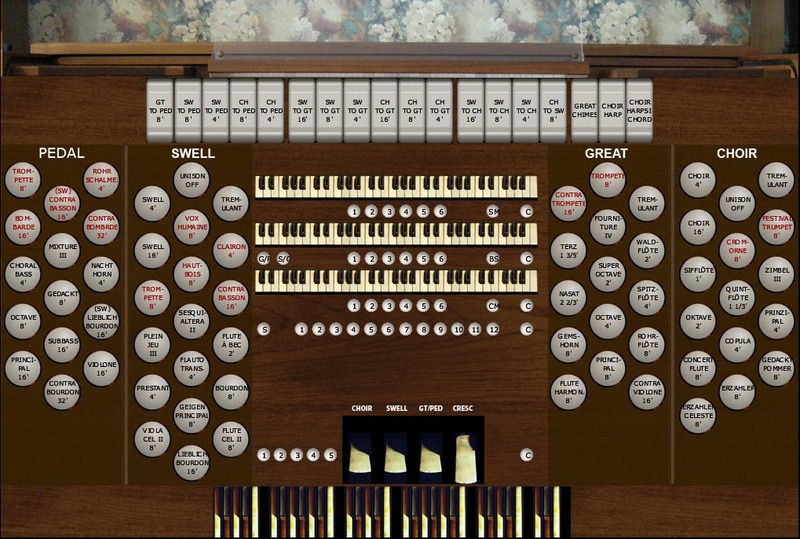 If you do not have Hauptwerk 4, you can still run Version 1.1 of the Model 945 organ. Version 2 sports a crescendo pedal, courtesy of Al Morse's software plus my own special software to massage Al's output into the graphical displays I have created. I have also completey rewritten the tremulants. Version 3 repairs an error in the swell enclosures that caused ranks to sound brighter when the boxes were closed. As usual, I have made my custom organ definition file available so that others can see how I have accomplished this, make their own modifications, and add to the rich set of instruments available to the Hauptwerk community. However, the CODM version does not, of course, contain the crescendo pedal. 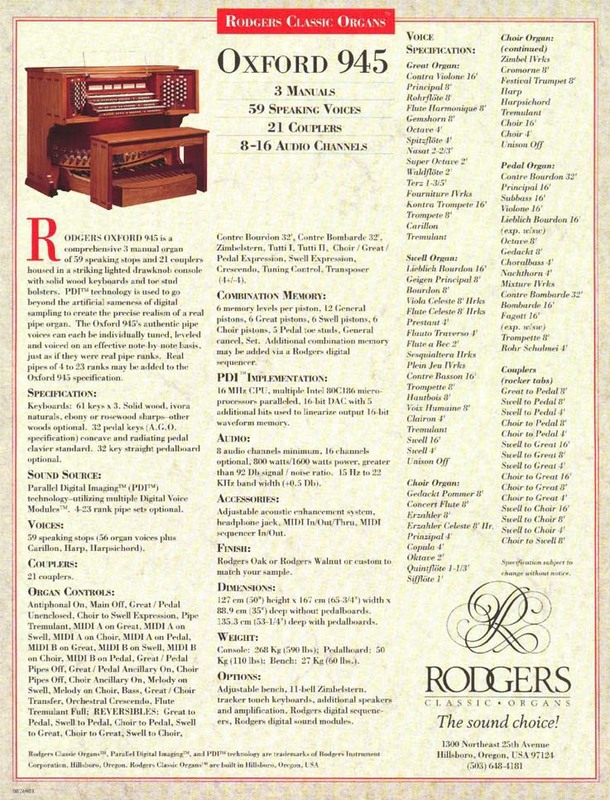 The specification of the Model 945 Organ is as follows. I have made notes where the specification differs from the original Rodgers. * The "Festival Trumpet" is an "en chamade" rank so it does not express with the Choir. In addition, just like on the Rodgers, it does not couple to other manuals. This allows the rest of the Choir to be used in ensembles set against the Festival Trumpet using the Choir Unison Off. The Rodgers has a 4-rank Mixture here. The Rodgers has an independent sample here, still expressed with the Swell. I chose to make this a borrowed stop. The Rodgers has a compound stop here with both the Erzahler and the celeste rank. The Rodgers has a 4-rank Zimbel here. The Rodgers has a "carillon" here. I chose to make this a "chimes" as I think this is more useful. The Rodgers has a 4-rank Plein Jeu here. This is my most complex project to date using Hauptwerk. 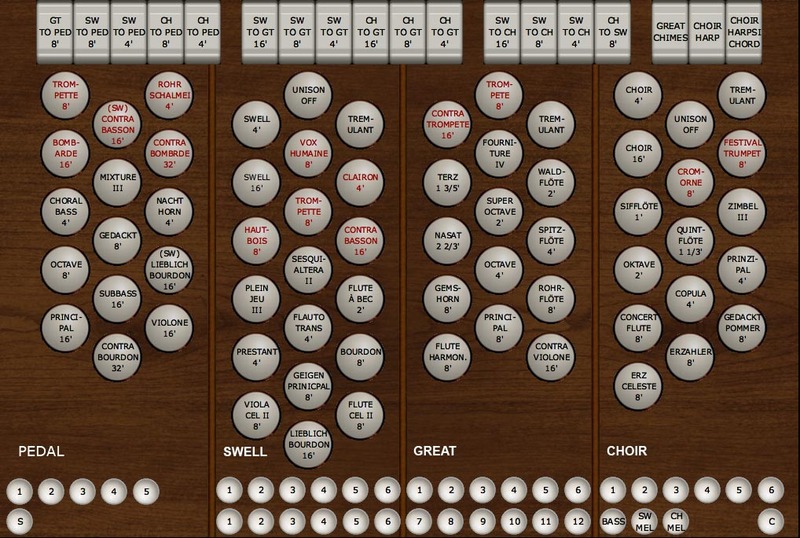 I have used most of the available features in the Custom Organ Definition Module (CODM) in one way or another. I encourage people to look through my source code. The Pedal comes entirely from the Jeux d'Orgues instrument. The 16' Principal, Subbass, and Violone all come from the 16' Subbass in the Jeux set. I have used the CODM's harmonic shaping to distinguish between them. The 4' Nachthorn comes from the 4' Flute on the Jeux organ Great. The Mixture is synthesized from several copies of the Jeux Positiv 4' Prestant. I have matched the composition of the Rodgers mixture. The 32' Contre Bombarde comes from the 16' Pedal Bombarde on the Jeux organ. I simply extended it down an octave using Hauptwerk's native capability. I was surprised at how well this worked. The 4' Rohr Schalmei comes from the Jeux Great 8' Trompette. I used harmonic reshaping to an extreme here and the result is excellent. The Choir uses samples from three of the source organs. The 8' Gedackt Pommer and Concert Flute both come from the Jeux Positiv 8' Bourdon. The Concert Flute is voices much louder and has been filtered to a duller timbre that matches the Rodgers stop well. The Erzahler and its celeste are from the Jeux Grand Orgue Salicional, voiced quietly with some filtering to distinguish them from the Swell string celestes. The 4' Prinzipal is from the Jeux Positive Prestant. The 4' Cupola is from the Jeux Great 4' Flute. The 2' Oktave is from two ranks. The lower 49 notes are from the Jeux Grande Orgue 4' Octave, pitched up an octave. The top 12 notes come from the Jeux Grande Orgue 2' Doublette, revoiced into a diapason. The 1 1/3' Quint is also from two ranks. The low 31 notes come from the Grande Orgue 4' Flute and the higher notes come from the Doublette. The 1' Sifflote comes the Jeux Positiv Doublette and it is only a 54-note rank. It is silent at the very top of its range. The Zimbel is the Jeux Positiv Cymbal. The Cromorne is from the Paramount's Clarinet - and it sounds like a Wurlitzer Clarinet (only all the notes work and are regulated - which is very atypical!) This is one of two compromises I made that would like to revisit as more free ranks become available. The Festival Trumpet comes from the Jeux Grande Orgue Trumpet. I voiced it very loud and reduced the harmonic content. It is very convincing and cuts through everything else on the organ. It was easy to disable the tremulant and expression. Disabling the coupling was a bit harder. I placed this rank in its own division, a Solo manual, and then created a Solo to Choir coupler which does not show and is permanently on. This worked perfectly. The Harp is from the Paramount's Chrysoglott. This is not a compromise - it is perfect for this organ. The Harpsichord is from the Sygsoft instrument. The Great is all from the Jeux organ with the exception of the Chimes. The 16' Contra Violone comes from two ranks. The lowest 12 notes are from the Jeux Pedal Subbasse. I voiced this very bright. The rest of the notes are from the Jeux Grande Orgue 8' Montre, transposed down an octave and made much thinner using the CODM filters. Both the 8' flutes come from the Jeux Grande Orgue 8' Bourdon. The Flute Harmonique is voiced much louder and is voiced a bit less bright. The Gemshorn is simply a softer, tinnier version of the Montre. Both the 2 2/3' and 1 3/5' mutations are taken from the Jeux organ Positiv. The 2' Super Octave is made from two ranks. The first 49 notes are from the Jeux Grande Orgue 4' Octave and the top 12 notes are from the Doublette. I created the Fourniture IV from eight ranks, duplicating the content and cutbacks of the Rodgers. The 16' Kontra Trompette is taken from two ranks. The lowest 12 notes are from the Jeux Pedal 16' Bombarde. The remainder is from the Grande Orgue 8' Trompette. As mentioned above, I created the Chimes by taking the single CHime sample from the Miditzer soundfont file. I carefully edited the sample to trim off any blank space before the attack. I created a single Wav file and placed it in the 537000 Installation Package so others can use this. Look at my CODM file to see how to create the stop. The Swell 16' Lieblich Bourdon comes from the Jeux Grande Orgue 16' Bourdon. The 8' Geigen Principal is from two ranks. The first 12 notes are from the Jeux Pedal 8' Octave. The remainder come from the Jeux Positiv 4' Prestant. The 8' Bourdon and its celeste are from the Jeux Grande Orgue 8' Bourdon. The Viola and its celeste are from the Jeux Salicional. The 4' Prestant is from the Positiv 4' Prestant. The 4' Flauto Traverso is from the Grande Orgue 4' Flute. The 2' Flute a Bec is the Jeux Positiv Doublette. The Sequialtera comprises the same two mutations as on the Great - but voiced differently. The Plein Jeu III is taken from the Jeux Grand Orgue Fourniture, which makes sense for this style instrument. I voiced it a bit lighter and softer. The 16' Contre Basson is from two ranks. The low 12 notes are again from the Jeux Pedal Bombarde, but voiced very lightly. The remainder is from the Jeux Hautbois. The 8' Trompette is from the Jeux Grande Orgue Trompette, but voiced lighter than the version on the Great. The Vox Humaine is my other compromise. It is the Vox from the Paramount 310 and it definitely sounds like a Wurlitzer rank. In this case, it works all right since this is a very similar sound to the Skinner voxes. The 4' Clairon is from the 8' Grande Orgue Trompette. I let Hauptwerk extend the rank up an additional octave and it sounds fine. The Rodgers, by default, has the Great and Pedal divisions expressing with the Choir. It has a coupler tab that is used to make these unexpressed divisions on demand. Although I know how I could emulate this using the CODM, it would have required creating two sets of Great divisions, adding a like number of ranks into RAM. I decided it was not worth the memory to do this, so I simply enclosed the Great and Pedal in their own expression box, giving it a thrid shoe on the console display page. I simply use Hauptwerk's "organ" options menu to assign my Choir swell shoe to either drive this new shoe or not, thus giving the same overall functionality. One more thing. I found a error in the sound samples for the Jeux d'Orgues Pedal 32' Subbasse. All notes above the second B were a half step flat. I discovered that the 059-B.wav file was the same as the 060-C.wav - so there was an extra B in the folder. If you are having the same problem, it is fairly easy to fix. Locate the PedSubasse32 folder within the package 001131. Delete the 060-C.wav file and rename all the higher number files to be the previous note. In other words, 061-C#.wav becomes 060-C.wav, 062-D.wav becomes 061.C#.wave, and so one. This will leave you one pipe short, the top G. Now go to the PedSubbasse16 folder and make a copy of the 055-G.wav file. Rename it 067.wav and place it in the PedSubasse32 folder. Now, reload the organ, being sure to reload the samples. Everything will now be fine. "The personal use of these soundbanks is free. However, you must contact Joseph Basquin for public or commercial usage, or if you want to publish Jeux d’orgues, or a modified version of Jeux d’orgues, on CDs, Internet, or by any other method. This soundbank still is and will remain free, but don’t forget that most similar soundbanks are not free, but rather expensive (usually more than 200$ for Hauptwerk/MyOrgan historical organs). This project will only be able to continue with your donations. Don’t forget to donate and help this project grow!" This is a Hauptwerk standard installation package in rar format. Save it to your disk, start Hauptwerk, and then use its install feature to read the rar file as per the manual. I have heard from some users (outside the USA) that you might need to disable the "wind model" for the organ to play properly. Since I am in the USA I cannot test this - but it sounds reasonable. This one is optional. I provide the source code for the Hauptwerk editor so you can see how I did all this and get ideas for your own projects. You will have to rename this file after downloading to "Les-945-v3_0.CustomOrgan_Hauptwerk_xml." I could not get the download function to work properly with the new extra-long file extension required by Hauptwerk 4! This organ is a great value. You get ~80 ranks for free (I get nothing - but I have great a day job. You might also consider contributing to the Jeux d'Orgues project on their web site and buying one of the larger Paramount organs) This organ is a complete three manual instrument - enough for most organ repertoire. Since the samples are 16-bit, the instrument fits into RAM on all but the very smallest computers - it fits in 4 GB on my laptop, even with a bunch of other programs running and with the machine connected to the Internet. The reverb on the samples is more than adequate for practicing - except for the Vox Humaine and Cromorne. I use the Rodger's internal reverb to smooth things out with these ranks. I also add additional convolution al reverb on my recordings.